Position your hands at 9 and 3 on the steering wheel. In order to maintain balanced, smooth control over your car, you should be in the proper driving position. Position your hands on the outside of the steering wheel at the 3 and 9 positions. Your left foot should be on the dead petal. Your right foot go from the accelerator to the brake without lifting your foot from the floor. To sit comfortably you should be 10-12 inches from the steering wheel. Ah this distance your wrist rest comfortably on the steering wheel at 12:00 with a slight bend in the elbow. This allows you balanced control also. 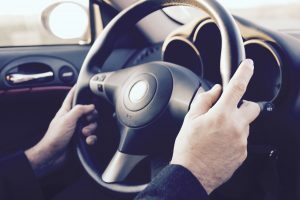 The steering wheel should be slanted toward your chest or body and not your face. The potential danger of the air bags deploying makes this necessary for your protection. The air bag deploys at 200 mph in 1/25th of a second. It is impossible get out of the way in time. The impact can cause damage to the face, arms or hands. Position your hands on the outside of the steering wheel resting your thumb on the outside. The 9 and 3 , position stabilizes your body in the seat. Thus allowing you to place your back squarely against the seat and your arms comfortably at the side. This position will inhibit oversteer in avoidance situations as well. The 8 and 4 position is acceptable as well. Using the push, pull slide method of steering you can virtually allow your hands to stay in this side to side position. This helps enable a quick emergency response. For example, in a right hand turn the left hand would not exceed the 10:00 position and the right hand would not exceed the 4:00 position. One hand would “feed” the wheel to the other in short movements. As you turn the corner you would let the wheel “slide” between your fingers as you accelerate. This allows the wheels to straighten on their own. The only time your hand should be in the 12:00 position is when you are backing up straight. Your left foot should be on the dead pedal and your right hand behind the passenger side seat. This allows you lift yourself up with the dead pedal in order to see over the back end of the car. However, backing to the left or right, keep your hands in the 9 and 3 position and look over your respective shoulders. You should position your seat at a distance where you can go from the gas pedal to the brake pedal in a smooth motion without lifting your foot off of the floor. This allows for cutting down on your reaction time. Your left foot should rest on the dead pedal. By positioning your feet on an even plane, you are balancing yourself from the roll and pitch of your vehicle. Drivers that balance themselves with one hand on the steering wheel at 12 o clock and do not have the stability. Also, their driving is not as smooth or effortless. Your head restraint should be raised or lower so that the top of your ears are at the top of the head restraint. Although sometimes referred to as a head rest, this restraint is to protect your neck in case of a rear end collision. You should not have your head resting on the head restraint while driving. © 2014 ASWDA. All Rights Reserved.